Today no armed conflict takes place without the participation of helicopters. They fly missions to transport people and cargoes, and provide close air support as well as taking part in search and rescue and reconnaissance missions. They operate day after day in arctic frost, in the heat of Africa, in the high uplands or in desert sands, evading enemy fire. We present five of the best Russian helicopters. Pilots have dubbed the Mi-26 the ‘flying cow’ in view of its enormous dimensions. If this helicopter were placed alongside a Boeing 737 the helicopter would appear longer. The total rotor area for a Mi-26 is in excess of 800 metres and the height is that of a three-storey building. Mi-26 helicopters have seen service in Somalia, Cambodia, and Indonesia, and have operated in the former Yugoslavia as part of UN peacekeeping operations. In 2002 the Mi-26 even rendered assistance to the United States Army. One of these helicopters recovered a downed CH-47 ‘Chinook’, the heaviest rotary wing aircraft in U.S. Army Aviation, nicknamed the ‘flying wagon,’ from an inaccessible location in Afghanistan to the American base at Bagram. None of America’s production heavy transport helicopters could match the capabilities of the Mi-26. Weapons payload for attack variants: 2-3 machine guns and up to 1.5 tonnes of armament on suspension points including 57-mm unguided rockets, freefall bombs and the ‘Falanga’ anti-tank system. Created more than half a century ago this helicopter has proved so successful, that to this day it remains the most widely exported Russian helicopter variant. There is no mission that a Mi-8 could not fulfil: rescue personnel from a hot spot, engage in close combat or deliver valuable cargo to a remote location. There have been occasions when a Mi-8 has even been used as a minelayer. This helicopter has seen service in every conflict including Afghanistan, Chechnya, and the Middle East and is in service with 50 countries. The Mi-8 is not likely to be replaced anytime soon. The most important testimony to its irreplaceability is in the use of these rotary wing aircraft by the U.S. Army in Afghanistan. This helicopter so impressed pilots and technicians with its reliability, low failure rate and technical efficiency that it was dubbed ‘Vasilisa Prekrasnaya’ (The Beautiful Vasilisa). 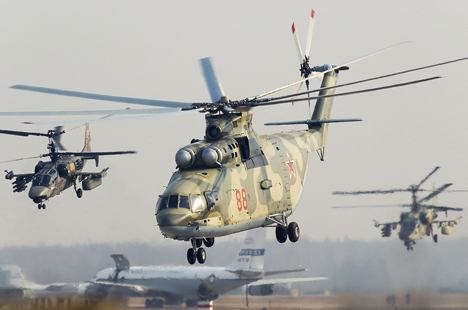 The Mi-38 is a next generation helicopter, a descendant of the Mi-8 workhorse. This rotary wing aircraft is distinguishable from its ‘parent’ by a six bladed rotor, the use of composite materials in the tail section, and also in its more advanced avionics. It is designed to operate over water in any climate as a transport and search and rescue helicopter, and as a flying hospital. The helicopter is not yet in series production, however we decided to include it among the five best because it has already set its own records. In 2012 during flight-testing the Mi-38 climbed to an altitude of 8,500 m, attaining the highest altitude of a helicopter in its class. Moreover the pilots who flew the Mi-38 mentioned that if they did not have a cargo hanging from the winch, they would have climbed to 9,000 m.
integrated armament: four-barrel 12.7-mm machine gun on a mobile mounting: external armament: freefall bombs, unguided rockets from 57 - 240-mm calibre, (NURS - Neupravlyaemye Raketnye Systemy - Unguided Rocket Systems), and the ‘Falanga’ anti-tank system, external cannon pods, and also up to 8 personnel in a troop compartment. The Mi-24 has been dubbed the ‘Crocodile’ in recognition of its unusual, intimidating appearance. Conceived as a flying Armoured Personnel Carrier (BMP Boevaya Mashina Pekhoty) with heavy armour, a large cargo compartment and powerful armament, this rotary wing aircraft is not really a helicopter in a general sense. It has the semblance of wings so the ‘Crocodile’ cannot hover in one location, and to lift-off it requires a take-off run from a runway just like an aircraft. Otherwise the heavy tail assembly would never get off the ground, weighed down as it is with a cargo compartment and external armament. An absolute world flight speed record for helicopters was set in the Mi-24 of 368.4 km/hr. This record still stands for Russian produced helicopters. Fast and manoeuvrable the ‘Crocodile’ has saved many thousands of lives, therefore veterans of the Afghanistan conflict prefer to call it the Lastochka (the swallow) or simply Lyubimaya (favourite). Armament: External cannon pods with a 30-mm 2A42 gun and 460 rounds of ammunition, Vikhr PTUR (Protvo-Tankoviy Upravlyaemye Rakety - Guided Anti-Tank Rockets) with a laser-beam control channel (LLKU - Lazerno-Luchevoy Kanal Upravleniya), 80-mm unguided rocket pods, aerial bombs and air-to-air missiles. The latest modification of the famous Ka-50 Chyornaya Akula (Black Shark), a two-seat helicopter has been produced from a single seat one, which has increased its functionality. The Alligator can do in flight what other helicopters in its class cannot even imagine. For example flying tail first or performing a ‘voronka’ – flying around a single target with its nose containing the weapons systems pointing continuously at the target. Helicopter aerobatics are possible thanks to the unique design of the Alligator. The helicopter has been created according to a coaxial design (in which two main rotors contra-rotate one above the other, and the tail rotor is absent). This type of helicopter is more manoeuvrable, handles better and is safer. The Ka-52 Alligator is recorded in the Guinness book of records as the world’s best attack helicopter.